As mentioned, Electric Light Orchestra was unique in that they harkened back to The Lads and the ’60s, but stayed true to the British rock of the ’70s. Even in the midst of a temporary pullback from pop music during my Jazz Fusion period, given the radio play this album generated1 with its handful of art-rock singles, just couldn’t avoid this double-LP. Even if I had wanted to. ELO’s seventh among the group’s most distinct and orchestrated, and eye-catching. 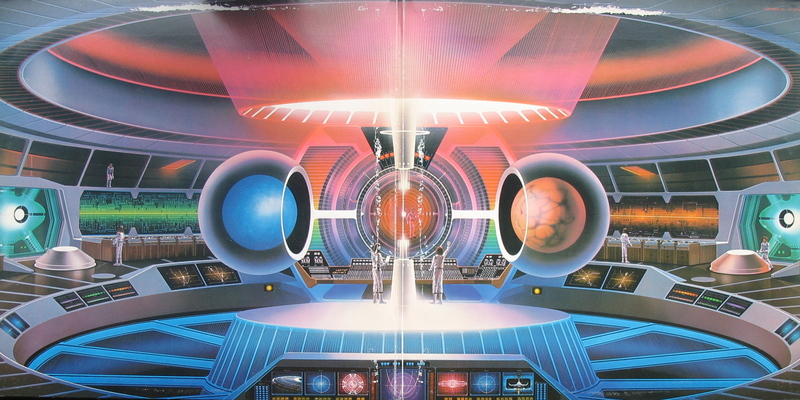 Plus, there was no way around the group’s symbolic spacecraft filling the LP’s cover; and beholden to its predecessor’s (A New World Record) iconic logo. Designed by Ria Lewerke for the legendary John Kosh, with illustrator Shusei Nagaoka lending a famous hand2, how could it not. Like some brilliant, multicolored mothership appearing out of the darkness, docking some craft from a Stanley Kubrick movie, it was bound to gather the attention of music fans. Hell, even those who just appreciated sci-fi, or merely fine drawing. Particularly when you opened that glorious double-album up and examined its scale and eye-appeal (as seen here). If you look close enough, that shuttle finding purchase in the great dark beyond has a registration (JTLA 823 L2) that happens to be the album’s original catalog number. I think also around this time, ELO were big enough to play Wembley Stadium and actually had this mothership as a huge prop hovering over the stage, certainly big enough to rival Pink Floyd’s flying pigs. That is a great cover; so typically ELO! Just listened to this all the way through again the other day. Some very tuneful stuff. And the Beatles pastiche of ‘Mr Blue Sky’ is sublime. Enjoyed seeing this placed as a fave cover – wouldn’t rate for me, too lollypop-like – but I can see the grandeur and fun, for sure. With the vinyl ‘resurgence’ we are certainly seeing some fine new album covers appear. Love it! Wow that’s really cool! Amazing attention to detail on this too, love it! That is one cool looking album cover. It is somewhat becoming a lost art, though most heavy metal bands take a lot of pride in their covers.